Induction of technology for safety improvements – Smart Coach: Smart coach with diagnostic system monitor bearing vibrations provides advance information on health of bearing wheel & track. In addition, coach has been provided with wheel slip protection monitoring. Further improvements are being brought about to provide fire safety through fire and smoke detection unit integrated with passenger announcement and information system for emergency evacuation and video analytics with phased detection and unusual occurrence features to further enhance safety and security. On-line Monitoring of Rolling Stock (OMRS): Implementation of OMRS is the first step towards predictive maintenance for its Rolling Stock. OMRS monitors the health of each rolling stock and identifies the defective bearings and wheels. Real time alarm is generated to take corrective action before the line failure of the rolling stock. OMRS equipment will also trend the condition of bearing when implemented in whole rail network of IR. 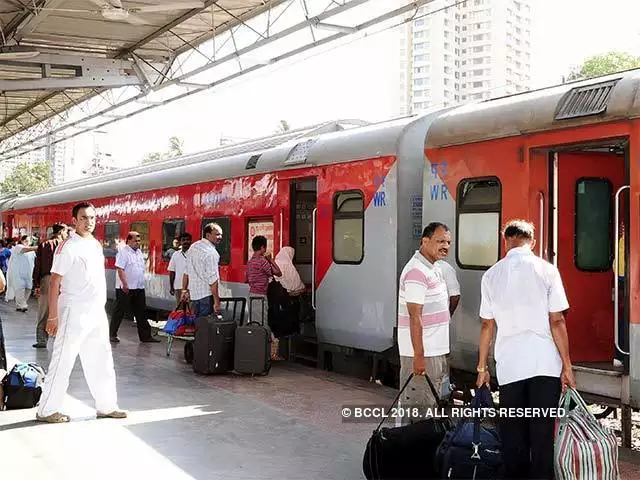 Complete switch over to LHB: Indian Railways have decided to completely switch over to manufacture of LHB design main line coaches from 2018-19 on wards. The production of LHB coaches in Production Units has continuously increased over the years Production of LHB coaches from 2004-05 to 2013-14 was 2327 coaches, whereas 5548 coaches were produced from 2014-15 to 2017-18. During 2018-19, it is proposed to manufacture 4016 coaches. Ground Penetration Radar (GPR) for monitoring health of track ballast bed ( Clear ballast cushion, Caked up ballast & ballast penetration in formation) and to prioritize deep screening of track in place of present practice of periodic screening every 500 GMT or 10 Yrs. Axle Box Mounted Accelero meters on pilot basis in 40 rakes in fastest train on selected high density trunk routes to monitor track requiring urgent attention and generate alerts to maintain organization on daily basis. Induction of semi-high speed Train-sets to European standard: ICF took up manufacturing of Semi High Speed (160 Kmph) Self Propelled Train-set with indigenous efforts, termed Train-18, with contemporary features as per global standards. The first train set has been rolled out by ICF in October 2018 and will shortly be ready for service after testing & trials. Improvements in AT Welding technology has been carried out to improve quality of welds for enhancement in safety. India’s tallest bridge with pier height of 141 m is being constructed on Irang River at Noney in Tamenglong district, Manipur as part of the Jiribam-Tupul-Imphal new line project. Its height will be almost equal to two Qutub Minars combined. Indian Railways has launched an innovative initiative for the station beautification with wall art of paints and graffiti or local arts with participation of local artists, private groups and volunteers. 65 stations across Zonal railways have been beautified under this initiative by utilizing skills of local artists, mostly using local art form, painting style, local themes or contemporary arts. This initiative provided forum for expression of the emerging talents in the area and visibility of local art forms to the travellers. Balharshah & Chandrapur Railway stations (Central Railway) Madhubani Railway station (East Central Railway) & Madurai Railway station (Southern Railway) Gandhidham Railway station (Western Railway), Kota Railway station (West Central Railway) & Secunderabad Railway station (South Central Railway) etc. have been beautified. Indian Railways has also commenced work on soft upgradation of 68 stations . This is targeted to be completed by 31st March, 2019. This initiative is to give substantial improvement to various passenger amenities like traffic circulation, inter platform transfer, waiting halls, facade improvement, lighting and accessible stations to Divyangjan. Bio-Vacuum Toilet: Vacuum flushing system toilets substantially reduce the requirement of water for flushing, while ensuring effective/ proper flushing of faecal matter from the pans. Bio-vacuum toilets have been provided in one train “Tejas” running between Mumbai & Goa. Vacuum toilets are being provided on all newly manufactured Tejas and Humsafar coaches from 2018-19 on wards. Procurement of another 2000 bio-vac toilets is under process. Railways have been instructed to provide Bio-vacuum toilets in coaches of all premium trains to begin with, to ensure proliferation of vacuum toilets at an accelerated pace. PUs shall be providing these in all new production w.e.f 2019-20. Smart Coach: MCF has rolled out a smart coach in Sept’18, providing better safety passenger amenities as well as enabling predictive maintenance. Diagnostic system monitor bearing vibrations provide advance information on health of bearing wheel & track. In addition, coach has been provided with wheel slip protection monitoring, water level indicator, Wi-Fi, infotainment system with emergency talk back and passenger announcement and information system along with digital destination board. Replacement of loco hauled commuter trains with Mainline Electric Multiple Units (MEMU trains: MEMU trains have a potential for average speed increment of up to 20 kmph in comparison to loco driven passenger trains. Busy Ghaziabad- Allahabad – Mughalsarai route has been made free from conventional trains by replacement by MEMU. For replacement of loco hauled commuter trains with MEMU trains on six routes, total 1048 MEMU coaches and 136 DEMU coaches are required. IR has planned to ramp up the production of MEMU rakes to 1232 coaches in next three years (approximately three times existing level) for ensuring full implementation. Total 124 pair passenger services have been replaced by MEMU/DEMU services on Indian Railways. The travel time has been reduced by 5-20 minutes in these services. Delhi- Mumbai, Delhi- Howrah and Mumbai- Chennai will be completed in Yr 2018-19. All routes will be made free from conventional commuter trains by Yr 2021. Introduction of Twin Pipe Air Brake System on freight trains: Twin piped braking system saves on an average ~90 seconds in every event of braking, which becomes significant over a long distance. All new wagons are being manufactured with twin pipe system. Retrofitment of all 1.7 lac wagons has been sanctioned. Approximately 11000 wagons have been retrofitted. Decision has been taken to stop the manufacture of conventional ICF coaches and replace them with LHB coaches with speed potential of 160 kmph. Successful trial of T-18 by ICF has been done and the same is in the process of commissioning. Exemption from weighment has been granted in case of loading of standard Bags of uniform size in container. Low density commodities like Pet Coke, Met Coke, Chuni and De-oiled cake have been exempted from mandatory weighment. Mumbai University Financial management, human resource management and Operation research.